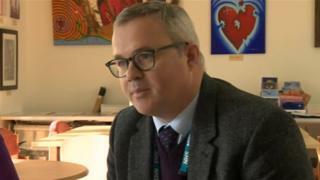 Image caption Dr Jonathan Pyott said the improvements were a "good starting point"
An NHS trust that was criticised for its treatment of mental health patients has been told it is now providing a "good" service. Strict conditions relating to heavy caseloads and staffing levels had been placed on Kent and Medway NHS Trust by the health service regulator in 2017. A follow up inspection last year found patients were still "at risk" because they are "not being properly assessed". The trust has now been found to be "safe, effective and well-led". The Care Quality Commission (CQC) said the trust, which provides services to about two million people, was "good" overall, with the trust's caring rated as "outstanding". But despite some significant improvements, the CQC said there are "numerous ligature risks" and blind spots on some acute wards putting patients at risk. Dr Jonathan Pyott, consultant psychiatrist, said: "It's not job done, this is a good starting point to move on to. The trust is very aware that we have got a lot of work still to do." Emma Bowler, the trust's lead nurse, said: "We do have our challenges but actually every day staff try to go that extra mile to make sure that the care that we provide is person-centred and obviously that is the side that the patients benefit from." Video What is it like to go through a mental health crisis?